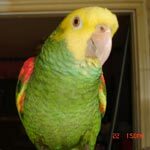 Parrot Forum • View topic - Jail for selling endangered species! Jail for selling endangered species! A man in China was sentenced to 5 years in jail for selling a pair of endangered parrots even though he claims to have bred them as, in China, you need to get a permit to do this (we need something like this in USA for ALL parrot breeders). Re: Jail for selling endangered species!